Discussion in 'Divisions' started by rjthomas909, Jul 21, 2013. IMHO: Definitely worth the add. It will not encumber your "space" objectionably will open up some operational possibilities if steam is in the mix for power. I noticed on the Sanborn map that one leg of the wye near Polk and Main comes very close to a building--the corner is cutoff. I like stuff like that, so I'd add that building. That's just me, though. Yes, and (Edit: a nearby block building with a similar corner cut) building still stands. It is two blocks from my mother’s house. She lives in Weir and was amused by the reason. Also the nearby culvert that’s still there, formerly for the tracks and now a road. There is also a cold storage building on the map which could be added to the module. I need to draw that in and find a picture of a reasonable stand-in. I am using DCC and do have auto reversers from the previous layout. Looking great, Bob. I am thoroughly impressed with the planning, design and the look and the feel of the modules that are developing. Keep it coming; it's motivation and inspiring for me when I'm stuck in a modeling lull with seemingly not enough time for much of anything, especially my hobbies. rjthomas909 and Ozarktraveler like this. I like the added touch. They also had a wye up in Arcadia. Think they disappeared when steam power did since the GP7's could be run in either direction and didn't need turning. Well not a Cardinal game for the memory books on opening day, but ALMOST a fantastic comeback! It turns out that this was quite a lot of ballast! Might be a two-man operation to stow this module now. This will be a bit more impressive with the Cherokee diamond in place next to the module, but I did not have time to set them all up this evening. Hope you all enjoy. Off to Texas A&M for a few days, but hopefully some more progress next week. If the weather cooperates, going to try and get the south Cherokee module built to connect up the Lightning Creek Mine. Edit: or http://www.modelrailradio.com/ (look for track planning contest near top of page). to be about the Crawford and Cherokee once it is a bit more mature. Feedback is welcomed and credit will be given should it ever make to press somewhere! Ozarktraveler, pensive, gjslsffan and 1 other person like this. Bob, I've been watching your layout build thread with great appreciation for what you have done in just a year. Have really enjoyed it!!! You do fast work in spite of all the travelling with your company. Great job Robert! I got a little surprise in the mail the other day. Your radio link is not working for me. Thanks guys, I updated the post with a different link. Hopefully you can find the article, Tom. Looking forward to a prominent display of some QA&P equipment in the near future. I am trying to find a suitable USAF "token" of appreciation. It will also be in the mail soon. Bob, the photos showing "a bit of scenery" are most impressive. By that, I mean the distribution of ground cover around the tracks, the texture and the color look very realistic, or at least on the mark for color photos and movies of the era. Feel free to point me back to any post where you may have already described, but what materials and colors did you use for that scenery treatment? Spent the evenings this week finishing up a couple of structures. One is the Frisco depot for my Weir City module. In the long term, I will scratch build one that better represents a Frisco prototype. 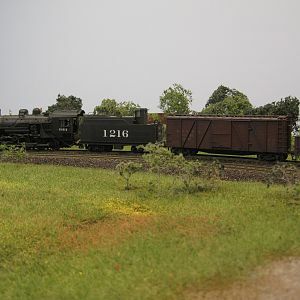 This one is a kit from Lake Junction Models (Kit 10016, MKT Standard 16' X 40' Depot), that I painted to be more Frisco-ized and changed out the shingles. It is about the right size, but not QUITE right. Just about to call it done, minus some final weathering and trim touch-ups. I also worked on a motor car shed from Mine Mount Models. This afternoon, I posed them both on the small module that couples to the Lightning Creek module for a small switching-type layout. You can almost imagine a small town here on the 9-inch-wide section.....if you really, really try. Well, I did not forget you Chris, and will try to post some info as soon as I pull out the scenery supplies. Looks like a rainy day here in San Antonio tomorrow. Just right for some modeling! Ozarktraveler, Joe Lovett, klrwhizkid and 2 others like this. Apologies for the long post. Chris (@yardmaster ) asked about scenery materials and colors used on the Crawford and Cherokee. I will use this post to try and add more details on scenery to answer that request. Spent the bad-weather weekend in San Antonio working on a Crawford and Cherokee module. This weekend's focus was the tail track module for Weir City that includes a small spur for a (notional) stock pen. It will also have a small wood culvert and drainage ditch next to a grade crossing just south of the depot. This module, like most of the rest, has had track installed and has wiring, feeders, and switch machines at this point. The module looked something like this at the beginning of the weekend. Areas with rougher scenery are covered with sculptamold to form terrain (white), and the road is built up using cork sheets. The ground areas are covered with a dirt-brown matte paint. I am using something called "Whiskey Barrel" from Home Depot (Behr brand). The track and rail are painted with an airbrush using a rail brown color from Micro Mark (Micro Lux is their brand of paint for several railroad colors). From there, the ties are colored with pencils, using the side of the pencil lead to to highlight the wood grain of the plastic ties and give some variety in color. The sides of the rail and the area near the rail on the ties is colored with Pan Pastels and a flat brush, dragged along the rail web. The pan pastels are Burnt Sienna and a Red Iron color. More rusty (red) for less-used tracks. The effect is somewhat subtle, but makes the track appear less homogeneous. The large tub is the final mix and the smaller one shows what the cinders look like alone. The ballast is put down with somewhat standard methods. I used full-strength Modge-Podge matte medium to put a layer of ballast on the shoulders, and after drying, spread ballast with a plastic spoon and wide soft brush to get a profile that I like. Ballast is glued down with "scenic cement" made from a mixture of 1-part Modge Podge (matte), 3-parts water, and a few drops of dish soap. The ballast is wet with 70% isopropyl alcohol, and the scenic cement is applied with an eye dropper. In this view, you might also note a small ditch cut next to the tracks and painted in with the regular ground color paint. Next, a variety of ground cover is used for various areas with grass, driveways, open dirt areas. These have come from a number of sources. The "Desert" ground cover from Arizona Rock and Mineral is used in grass and unkept areas of ground. The "chats" color comes from mixing N-scale limestone ballast, the concrete driveway mix, and some earth colors. It is used for driveways and chat roads. The fine earth color (this one came from a local Texas brand of ballast maker) is used for areas like the stock pen or dirt roads, and will have other highlights added with ground up artist pastel chalks. This stuff is put down by painting on a mix of the Modge Podge, thinned with about 30% water. I use a disposable foam brush, and then the metal shakers are used to spread a fine layer. This is then sprayed with Isopropyl alcohol and a dropper is used to add more scenic cement over the layer. It will spread on its own somewhat evenly, but if the dried color looks uneven, you can paint over a layer of scenic cement after it dries. Next, the rough (desert ground cover) areas will get some static grass. I am using primarily the late summer color from Silflor, that I get from Scenic Express or at train shows in the area. Because I am going for a summer look, I mix in a bit of the green-gray color from woodland scenics (flocking), and to simulate weeds, and have a mix of color, I add in a few pinches of the short Noch summer grass. It has reds and yellows in it. There are at least three lengths of the Silflor available, and I mix these lengths with mostly long for areas in the open, and shorter lengths near buildings, etc. I put down a mix of the 30% thinned Modge Podge with a foam brush, a small area at a time, and put the static grass down with a home-made applicator made from an electric fly swatter and metal strainer. It works great, but when I hit the ground pin for an arc, grass goes everywhere! (The board and jar of BB's is holding down a grade crossing being glued in). The trees (not in yet on this module) are SuperTrees from Scenic Express. The armatures are painted a gray color, with small ones sometimes left natural. A variety of leaves are used, cemented on with the same homemade scenic cement and some hair spray for a final treatment. Edges between track and grass, areas along roads, under large trees, and other untreated gaps/places get filled with finely ground and sifted dry leaves, prepared at home from the yard. Loose material is sprayed with the Isopropyl alcohol and stuck down with some of the scenic cement. Ok, that's it for today....still waiting on some glue to dry to finish up this weekend's project. @yardmaster, if you have other specific questions, please reply and I will try to amend this post. okrlroads, Ozarktraveler and Joe Lovett like this. Great write up Bob, you have been busy!!! I will definitely keep your information for future reference, thanks for posting. Particularly like the step by step instructions and photos to go with it. I've been enjoying your build thread.